A dazzling future for solar power? Concentrating solar power plants like the PS10 near Seville, Spain may provide around 10 percent of world electricity by 2050. Renewable energy expert says solar power's time is "starting to come"
London, England (CNN) -- Solar power is expected to provide almost a quarter of the world's electricity supplies by 2050, according to a new report published by the International Energy Agency (IEA). Eleven percent of total supplies are predicted to come from solar panels on homes and offices while a further 11 percent will be provided by central solar power stations feeding clean electricity to populous areas. Solar power currently accounts for 0.5 percent of total electricity supplies, but this will need to rise if cuts in carbon emissions are to be achieved, according to the IEA. Executive director of the IEA, Nobuo Tanaka said in a statement: "The combination of solar photovoltaics and concentrating solar power offers considerable prospects for enhancing energy security while reducing energy-related CO2 emissions by almost six billion tonnes per year by 2050." The future success of solar power stations (known as Concentrating Solar Power or CSP) will depend on the development of "dedicated transport lines," but the IEA predict that it could become competitive with coal and nuclear power plants by 2030. The IEA expects North America to be the largest producer of CSP electricity, followed by India and North Africa -- which will likely export half of its output to Europe. With the right policies in place, the IEA says that solar panels on residential and commercial buildings could compete with traditional electricity supplies by 2020 in many regions. 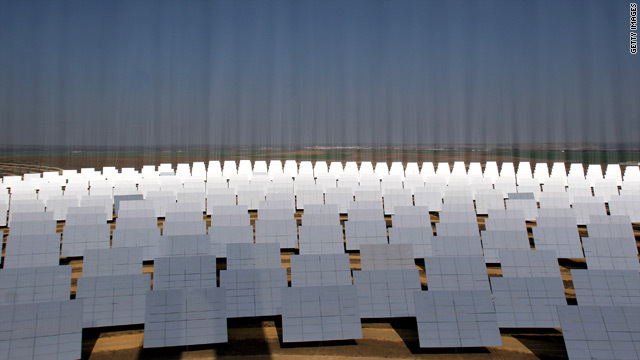 By 2030 the IEA anticipate solar panels will provide five percent of global electricity. Tanaka, who announced the initiatives at the Mediterranean Solar Plan Conference in Valencia, Spain, called for "long-term oriented, predictable solar-specific incentives" in order to "bring both technologies to competitiveness." Professor Philip Eames, director of the Center for Renewable Energy Systems Technology at the UK's Loughborough University believes that solar power is a viable alternative to fossil fuels. "Realistically, I think solar power has quite a bright future. I've seen predictions before and they are becoming more and more bullish as the technology develops," Eames told CNN. "If you look at the resources that are available and the way technology has developed in the last few years, there will be quite a large increase in solar panels and CSP if it keeps developing." Eames says costs of solar panels have come down a "huge amount" over the past 12 months and will continue to fall as the technology develops and CSP's maintenance costs are relatively small. "Solar power's time is starting to come," Eames said.